Tomatoes are the most commonly grown vegetable in home gardens in America, according to the University of Illinois. Because tomatoes are naturally acidic, vinegar can be used as a natural fungicide as well as a fertilizer on these tasty and nutritious plants. Vinegar can be beneficial for tomato plants. Vinegar is a natural substance that has a wide variety of uses. It is acidic, but not toxic, which means it is safe to consume. For that reason, it can be used on edible as well as non-edible plants without harming them, as long as it is used in moderation and diluted with water. Tomatoes are prone to fungal diseases, especially during periods of wet spring weather. A combination of apple cider vinegar and water can prevent and treat leaf spots fungi, mildews and scab diseases. Combine 3 tbsp. of cider vinegar with 1 gallon of water. Put the solution into a spray bottle and spray your tomato plants every morning. 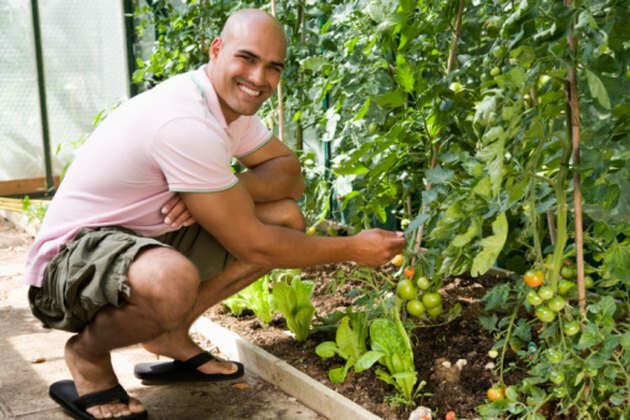 Fertilize your tomatoes with a mixture of water, ammonia and vinegar. Combine 1 cup ammonia with 2 cups of white distilled vinegar, then add it to 5 gallons of water. Use a watering can to sprinkle this mixture over your tomato plants and the surrounding soil. Do this about once every two weeks in the spring. This will encourage fruiting.